Carlisle Piloted Oxygen Fishtail Tips are manufactured from a heat resistant stainless steel alloy. They can be used on a number of different hand torches, on machines, or in custom manifolds such as a crossfire setup. Carlisle tips are manufactured for use with a mixture of oxygen and either natural gas, propane, or mixed gas. Although some of Carlisle's other tips are used with a hydrogen and oxygen mixture, it is recommended that this mixture not be used with any type of piloted tip. Fishtail tips can have one of two types of flames, depending on the port configurations. These two types are parallel and divergent. 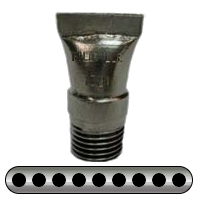 A Fishtail tips flame is parallel when the drilled porting that is utilized up the burner is all drilled at the same angle so that all focal points are parallel with one another. The flame is considered divergent if the porting is at different angles causing the flame to fan out to a wider focus than the face of the head. Piloting allows the flame produced by a tip to experience increased stability. Carlisle Piloted Oxygen Fishtail Tips achieve this effect through a ring of smaller drilled ports around the larger porting. This low level of burning gas forms a sort of supporting foundation around the center flame. Due to the increased stability, an operator is able to push the torch harder without the flame moving off of the face of the tip. 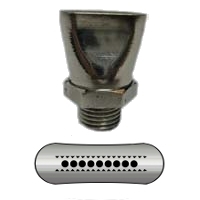 Carlisle Un-piloted Oxygen Fishtail Tips are manufactured from a heat resisting stainless steel alloy. They can be used on a number of different hand torches, on machines, or in custom manifolds such as a crossfire setup. Unlike the Piloted Fishtail Tip Series, these tips only have the larger porting and no smaller porting. The lack of supporting flame from the missing piloting means that the tip can not be pushed as hard as a tip with piloting. Although, it is important to note that with an un-piloted tip, an operator will achieve a much sharper flame.